An international team of astronomers has shattered the cosmic distance record by measuring the farthest galaxy ever seen in the universe. This surprisingly bright, infant galaxy, named GN-z11, is seen as it was 13.4 billion years in the past, just 400 million years after the big bang. The investigation of GN-z11, which is located in the direction of the constellation of Ursa Major, was led by astronomers at UC Santa Cruz, Yale University, and the Space Telescope Science Institute (STScI). The team's findings will be published March 8 in the Astrophysical Journal, and the paper is now available online at arxiv.org. This comes less than a year after the same team broke the galaxy distance record in May 2015. Coauthor Garth Illingworth, professor of astronomy and astrophysics at UC Santa Cruz, said the team pushed NASA's Hubble Space Telescope to its limits to get the spectroscopic data needed to determine the galaxy's "redshift," a measure of its distance from Earth. The new Hubble observations take astronomers into a realm that was once thought to be only reachable with NASA's upcoming James Webb Space Telescope. "It's remarkable that Hubble could do this," Illingworth said. "This new discovery shows that the Webb telescope will surely find many such young galaxies reaching back to when the first galaxies were forming." "We've taken a major step back in time, beyond what we'd ever expected to be able to do with Hubble," said first author Pascal Oesch of Yale University. It takes so long for light from GN-z11 to reach our telescopes that we see the galaxy as it was when the universe was only 3 percent of its current age, he said. This measurement provides strong evidence that some unusual and unexpectedly bright galaxies found earlier in Hubble images are really at extraordinary distances. Previously, the team had estimated GN-z11's distance by photometric techniques, using filters to measure light at different wavelengths with Hubble and NASA's Spitzer Space Telescope. 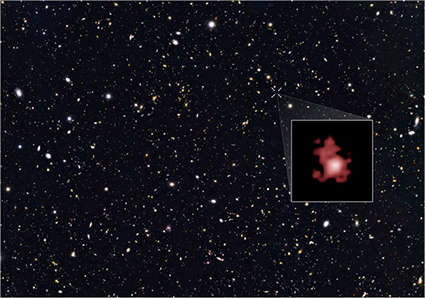 Now, for the first time for a galaxy at such an extreme distance, the team used Hubble's Wide Field Camera 3 to precisely measure the distance to GN-z11 spectroscopically by splitting the light into its component colors. 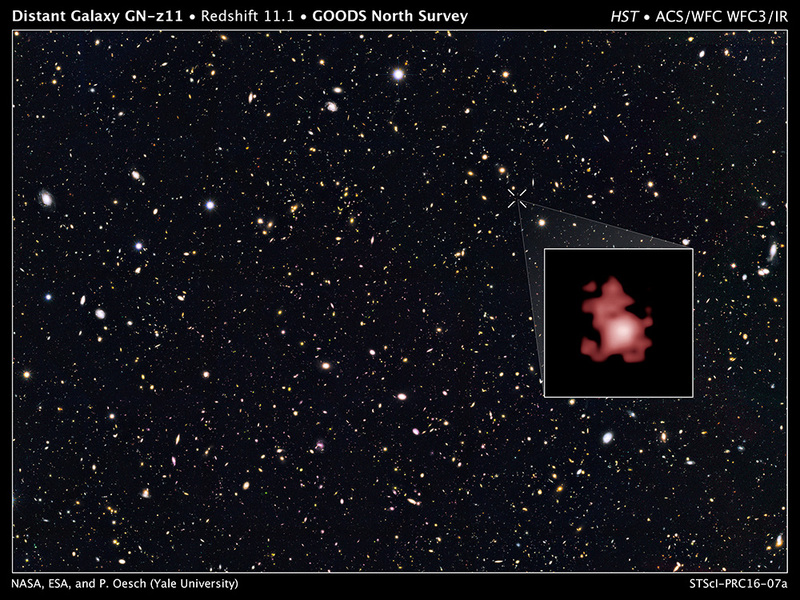 Astronomers measure cosmic distances by determining the redshift of a galaxy. Due to the expansion of the universe, every distant object appears to be receding from us because its light is stretched to longer, redder wavelengths as it travels through expanding space to reach our telescopes. The greater the redshift, the farther the galaxy. 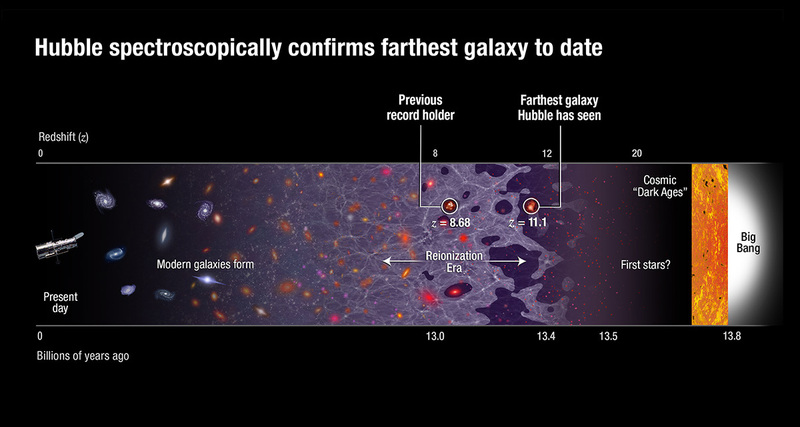 "Our spectroscopic observations reveal the galaxy to be even farther away than we had originally thought, right at the distance limit of what Hubble can observe," said coauthor Gabriel Brammer of the Space Telescope Science Institute. The combination of Hubble's and Spitzer's imaging reveals that GN-z11 is 25 times smaller than the Milky Way and has just one percent of our galaxy's mass in stars. However, the newborn GN-z11 is growing fast, forming stars at a rate about 20 times greater than our galaxy does today. This makes such an extremely remote galaxy bright enough for astronomers to find and perform detailed observations with both Hubble and Spitzer. The results reveal surprising new clues about the nature of the very early universe. "It's amazing that a galaxy so massive existed only 200 million to 300 million years after the very first stars started to form. It takes really fast growth, producing stars at a huge rate, to have formed a galaxy that is a billion solar masses so soon," Illingworth said. These findings provide a tantalizing preview of the observations that the James Webb Space Telescope will perform after it is launched into space in 2018. The discovery also has important consequences for NASA's planned Wide-Field Infrared Survey Telescope (WFIRST), which will have the ability to find thousands of such bright, very distant galaxies. To learn more about galaxy GN-z11, join a live "Hubble Hangout" discussion with astronomers and scientists at 12 noon Pacific Time on Thursday, March 3, at http://hbbl.us/y6H.